Lucinda was one of my students recently, just last month, in Ann Arbor MI. She just shared with me this picture and email. 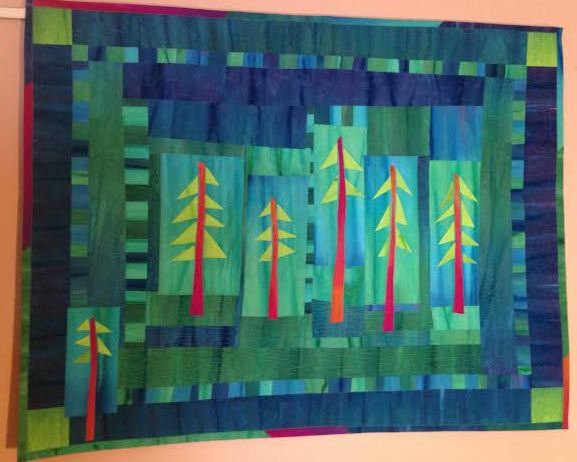 It is quilted and hanging on the wall. I love seeing how people change the designs we start with in class and make something that is their own. That is what sharing and teaching is all about. Sharing what you have learned and watching people lift off with ideas and inspiration. I love the extra tree in the bottom left corner of the piece and the fact that she used all her leftovers to make the binding. Good job. I’m done and so happy with it. I’ve had friends say it looks like mosaic, and also like tiles from a tile company here in Ann Arbor called Motawi Tile. It’s 30 x 39 and I pieced the border with most of the colors. And the traditional quilter in me had to put cornerstones in the outside border. I’ve decided the wall is too big for just this quilt, I might have to order one of your fabric kits and do something else.